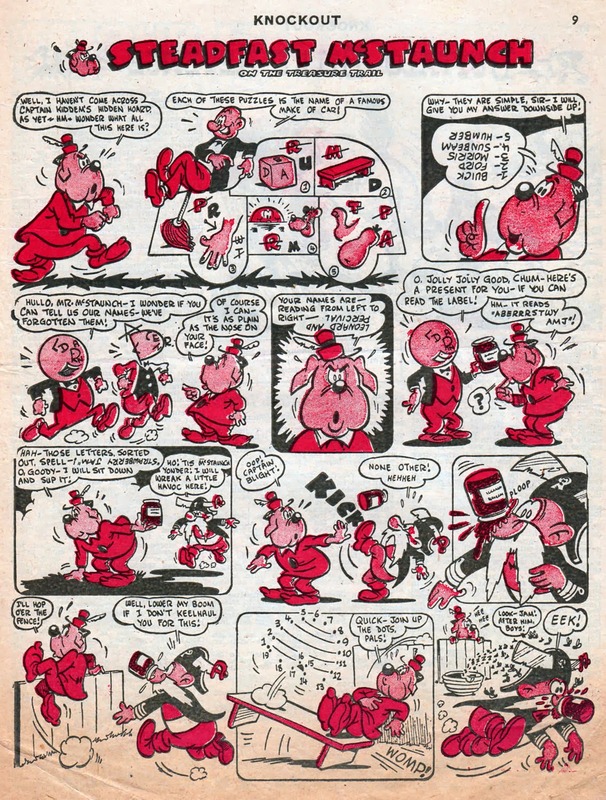 Those of you who read the early issues of Whizzer and Chips may remember Denis Gifford's inventive comic strip Steadfast McStaunch, that appeared on the inside back page of the Chips section. However, the character wasn't new to comics. He had originated in the pages of Knockout comic in September 1950, running on and off until June 1952, also written and drawn by Gifford. Shown above is an episode from Knockout No.662 (November 3rd 1951). 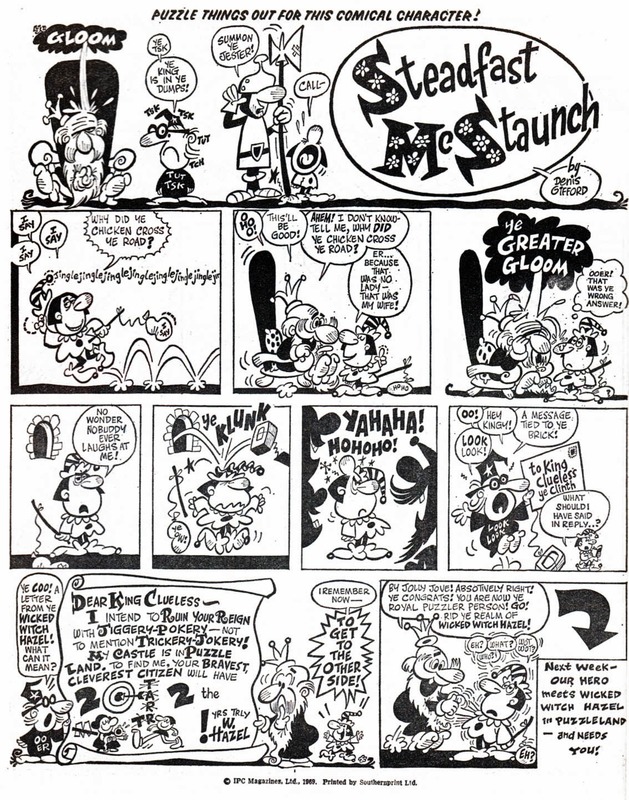 Below, is the strip from Knockout No.690 (May 17th 1952). 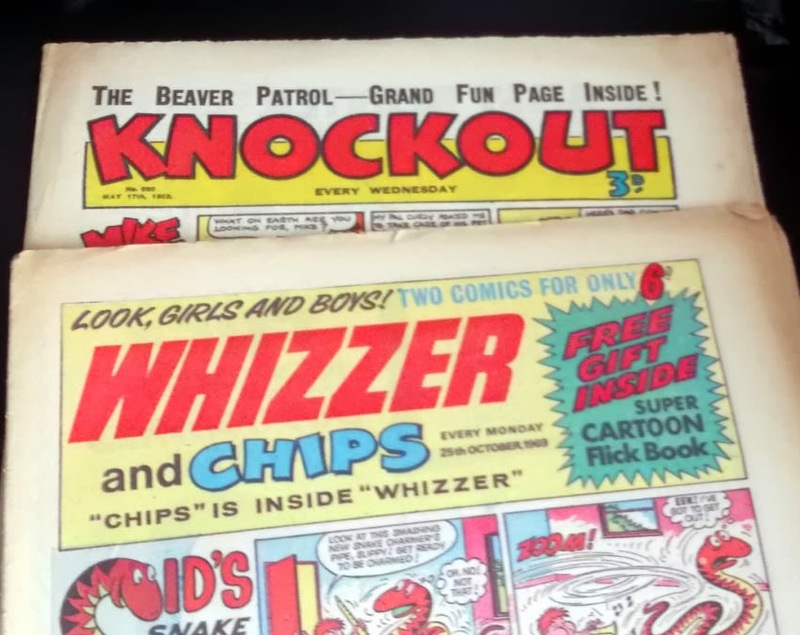 Denis Gifford's mixture of puzzles and comic strips was a good concept, and clearly one that IPC's Bob Paynter thought worth resurrecting in 1969 for the launch of Whizzer and Chips. 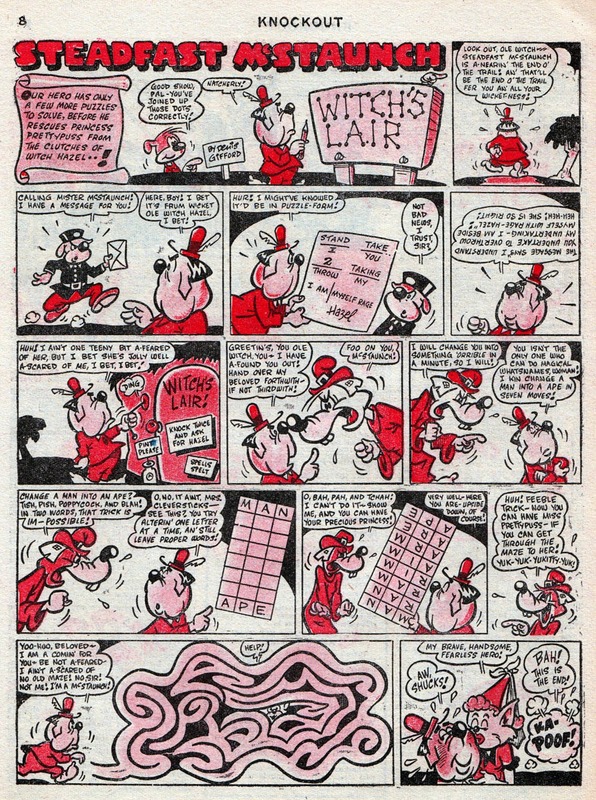 Rather than reprint the 1950s version, Bob commissioned brand new strips for Denis to create. You'll have noticed by now that there's a considerable redesign in the appearance of Steadfast. In the 1950s he appears to be a dog, somewhat modeled on the animated character Droopy, whereas in the 1969 series he's a human court jester. Gifford's art style had also developed in the intervening years and had become more polished and distinctive. Always a fun page to read and participate in (you'll see I joined the dots in the puzzle in the one above) but sadly Steadfast McStaunch was dropped from Whizzer and Chips in 1970 in favour of more traditional and formularized fare. Interesting... I enjoyed the "Jester"-style one in the Giant Holiday Fun Comic Album, so finding out he was once a dog... As I say, interesting. Wonder what informed that decision? My guess is that funny animals were going out of fashion by 1969 so perhaps they wanted to make him more relatable for the kids. According to another blogger, Bob Paynter told Denis readers don't like animal strips, although Ginger's Tum was one. Blimey's a great site, Lew. I can't praise it enough. But special thanks for putting up Steadfast McStaunch, very fondly remembered. I never had W&C#1 so great to see that, and seeing the strip from #2 again for the first time in about 40 years is a treat. I think Denis Gifford's artwork is cruelly overlooked. Despite his avowed disdain for 'modern' comics, he developed a very cutting-edge style compared to other UK artists of the time. I'm guessing he was inspired by Gene Deitch's work, though how he'd have encountered it on these shores is a mystery to me. As Denis worked in radio and TV as well as comics, he no doubt met various contacts from overseas so I guess he'd be aware of Gene Deitch. There's definitely a Harvey Kurtzman influence to Denis' cartoons too. 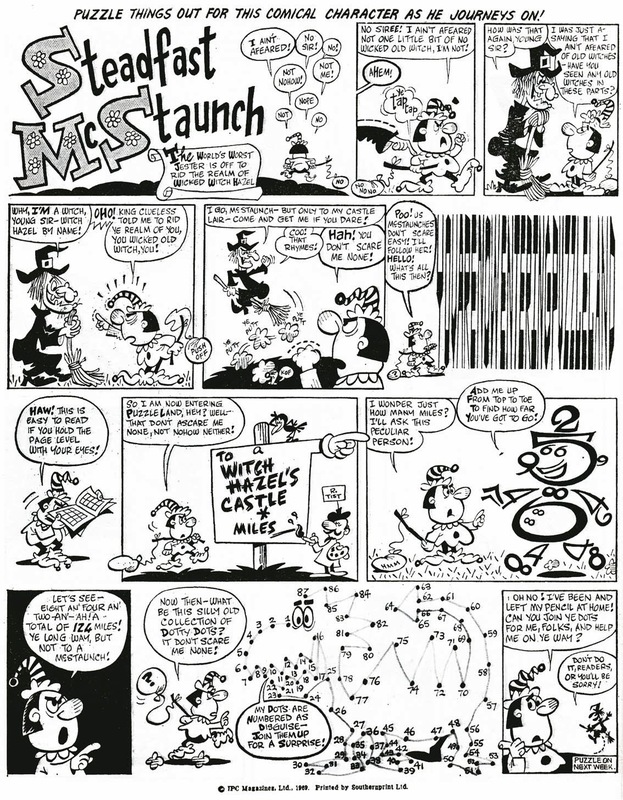 The Steadfast McStaunch pages are SO reminicent of the the Harvey Kurtzman Hey Look! pages that appeared in the US. This makes me wonder just how much direct influence the US artists had on the UK guys (and vice versa, too!). Its a topic I haven't seen explored anywhere? A few "cross-overs" that I have noted: Brian Lewis "swiped" a giant octopus sequence from Hal Foster, in the fantastic Supercar Annual that Brian drew, cover to cover. It WAS a swipe...I remeber asking him about it. He was a great admirer of the top US guys. Conversely: I noted that Wallly Wood (possibly Adkins and Wood?) swiped some Frank Bellamy Project Nimbus space-ships for a Flash Gordon short that appeared in one of the King Comics Phanrom issues. I showed a load of Bellamy to Frank Miller back in the 80's when he was visiting, and he was KOCKED OUT. I remember him commenting on Heros especially. I think Lynn Varley's fabulous colouring on 200 was surely influenced by Bellamy; the wild page break-downs;the wolf sequence; the subject matter generally. There's no criticism implied here anywhere by the way....I personally LOVE seeing such high-level homages. Hi Mike! Good to hear from you. You're right. There must be quite a few swipes in comics. It was an accepted practice when deadlines were looming. As long as the artists could do their own thing too, and Brian Lewis certainly could, it's quite acceptable I think. Good point about the Heros/300 similarities. I noticed that too. The Spartacus TV series has picked up on that too, although they probably don't know that stark, saturated look originally came from a British comic strip. The early incarnation of Steadfast looks like a cross between Droopy and Penfold. I have some of Kim Deitch's books, and knew his father was an animator, so I've sure Denis would have been aware of him too. In fact, I've just noticed on one of my shelves that Denis wrote a book on cartoons in 1979 ('The Great Cartoon Stars'). The book is quite a breezy read; just quick synopsis of numerous characters, but it shows he had an interest in the field.